Vegan baking can initially seem intimidating, but really, it’s not so different from the standard procedure that you probably grew up on. For the most part it’s just a simple series of 1:1 substitutions, like plant milk for dairy milk and vegan butter for dairy butter. And eggs? What of them? In vegan cookbooks everywhere, and all across the Internetz, you’ll find recipes referencing “flax eggs”. Sometimes they’re actually even written as components, for example “1 tbsp flax meal + 3 tbsp water”. Which seems pretty self explanatory, right? You’d think! 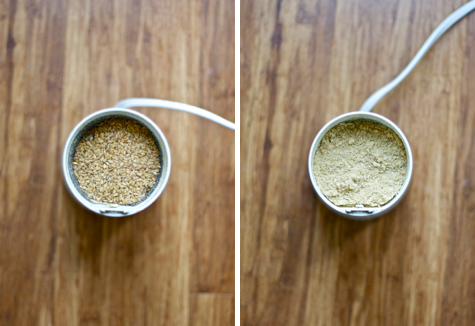 Begin with whole, raw flax seeds. Buying pre-ground flax is a dangerous game, as the oil is very unstable, and once released (via grinding) it will turn rancid pretty quickly. So buy your flax seeds whole and grind them yourself, to spec. It’s easy enough; you can use a coffee grinder, a hand-crank spice grinder, a mortar and pestle, or a high-speed blender. Process into a very fine powder. 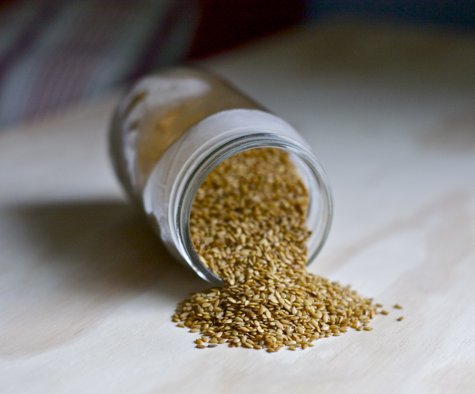 Store whole flax seeds in the refrigerator or freezer. Make egg/s. 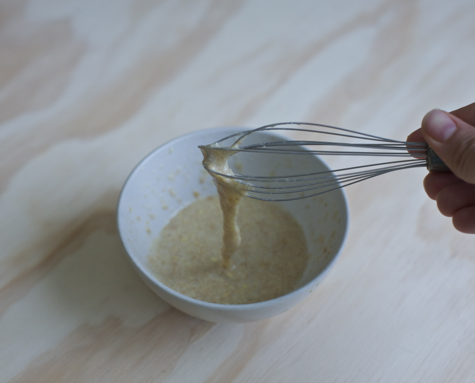 One egg equals [1 tablespoon flax meal plus 3 tablespoons water], and you do not need to make each one individually. 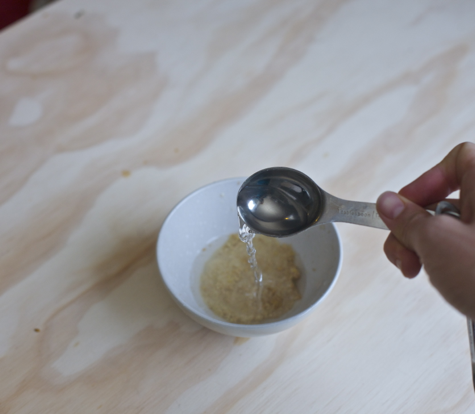 In a small bowl, add flax meal followed by water (not water followed by flax), stirring as you go. 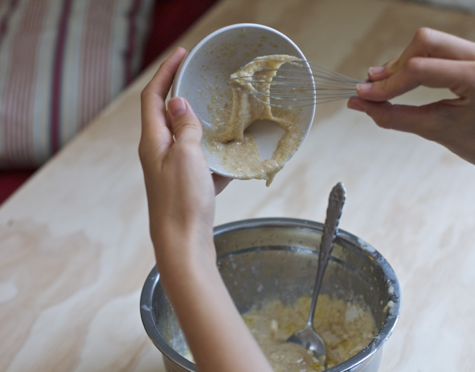 I use a miniature whisk because it’s adorable, but a fork works just as well. Refrigerate. This is key! Place the bowl of eggs in the refrigerator for a minimum of 15 minutes, but up to an hour is best. This will allow your egg to “set up”. Don’t skip this important step! I always make my eggs at the start of a recipe. That way, I can get them in the fridge, and then work through the other steps while the eggs set. When the eggs come out of the fridge they’ll have formed a thick sticky goo, just the consistency of egg whites. There’s your binder! Add it to the recipe and proceed as instructed. Note: Flax has a nutty, somewhat distinctive flavor. It’s pretty well masked in recipes such as whole wheat breads, spice loafs, and other “full-bodied” treats. But for something like white cake or sugar cookies, you may notice the flavor. If this bothers you, try using chia seeds instead! They work just the same and don’t add any flavor (though admittedly, they cost about four times as much). We live near small, family run chicken farms and they are raised in humane conditions. They even allow small visits (not so much a tour) of the inner workings of the farm. Of course, not everyone lives nearby a chicke farm but there are humane ways to buy chickens and eggs. (As long as you’re not against the slaughtering of chickens for food, that is.) Thereis also a website that grades egg farms. It’s so sad that we have to eat our food so suspiciously these days! Thank you for this advice on flax eggs. I read to go vegan for purposes of my nursing baby. This is so helpful! do yu have to refrigerate flax seed? I have had some on the counter for months is it safe to eat? It goes rancid pretty quickly. It won’t *hurt* you if it’s rancid, but it might taste funky. It’s best to keep flax, especially after it’s ground, in the fridge or freezer. Thank you for posting that. I just bought some for my first try with flax binder and wasn’t anxious to throw it out or return it to the store for them to lose money either. And it smells fine. This bag will last me forever. Jessy – that person just posted about their farm. You then claimed they were lying,.. without checking at all. That’s inhuman to put down someone else’s work and life … without knowing them. Thank you for this recipe. I’m going to use it. Flax seeds are known for the benefits it provides from the jelly it makes on bowel movement. It’s easy to grow flax. I’ve once dropped some in a flower box and it makes pretty little blue flowers which change in little bowls of seeds. I own a small farm and I have many friends that have farms with chickens. Trust me, are chickens are spoiled constantly. They only get the best organic grains and seeds (a chickens natural diet) with home-grown fresh fruits and veggies. They also get organic meal worms for protein (and trust me it costs a pretty penny). As for the males if they are cruel to the hens and aggressive to people (which some roosters naturally are) they are either sold to good homes or HUMANELY put down. I have only had one aggressive rooster on my farm and I sold him to a good friend who didn’t care if he was mean or not. As for most my roosters they are treated more like small dogs then chickens. The birds follow my daughter everywhere (Including waltzing into the house mush to my dismay) and love being carried around the farm while she does chores. Chickens can be raised humanely and loved. How long can I keep a flax egg in the fridge and it still function? I planned to bake something and made the flax egg, but was pulled away and couldn’t make it so I put the flax egg in the fridge. Will it still work a few days later? Flax and sesame plants are unrelated to each other. You should have no problem. You don’t need eggs of any sort in granola bars. You can use any sort of syrup. Maple syrup or fruit paste (dried fruit ground with water) would work well instead of honey. Another desert dweller here, and I have never succeeded in getting the right texture and consistency. So I will try refrigerating. Sarah, how much ground flax do you use to sub for 1 egg in a recipe?